Oyster mushrooms are pretty, frilly-edged, delicate fungi that are usually a dove gray color, but also come in sunny yellow and rose pink colors. They are so named for a variety of reasons. First, they are often the color of raw oysters. Second, their slightly curled edges resemble those of an oyster lying in its shell. Third, they take on a smooth oyster-like texture when cooked. And finally, for their ever-so-slight seafood-like flavor. A very subtle seafood-like and/or anise flavor is common in oyster mushrooms. Again, it's a subtle effect that becomes undetectable in most dishes. In the end, oyster mushrooms have perhaps the mildest flavor of all mushrooms, with very little of the earthy note that defines most varieties. Oyster mushrooms also take on a velvety texture when cooked, turning from a slightly spongy mouthfeel to something wonderfully luscious, especially when cooked with a bit of liquid in the pan. Look for mushrooms or clusters of mushrooms with a bright, springy texture and no wilted or dark spots (they indicate the mushrooms have soaked up moisture and started to go bad). Like all mushrooms, water is the greatest enemy of oyster mushrooms. Store them in paper bags (not plastic!) in the fridge for up to a few days. These are delicate specimens, and they will start to wilt and otherwise turn less-than-perfect the longer they sit and wait to be eaten. The delicate texture of oyster mushrooms means they dry out quickly. In fact, if you store them in the fridge wrapped only in paper long enough, they may well "dry" pretty thoroughly. Dried oyster mushrooms don't need to be soaked to be rehydrated the way other dried mushrooms do—just add them to the dish and they soak liquid up right away. Cultivated oyster mushrooms usually don't need much cleaning—simply wiping off any bits here or there with a dry paper towel will usually do the trick. Like all mushrooms, oyster mushrooms act almost like sponges, soaking up any water they come into contact with, so whatever you do, don't leave them sitting in water, even for the sake of cleaning them. One of the most popular ways to cook oyster mushrooms is to stir-fry or sautee them. This requires a preheated hot pan, lots of stirring, and a few minutes. Make sure to give them space so their moisture can cook off as they let it off, that way they will truly sautée rather than steam. See detailed directions here. Because they get so silky when cooked anyway, oyster mushrooms respond well to braising, or slowly cooking in liquid, too. Add them to soups or stews with confidence. A few less common options for cooking them include dredging oyster mushrooms in seasoned flour and frying them for a surprisingly delicious treat, using them to top a tempting mushroom garlic pizza, or adding them to an utterly creamy pasta sauce. If that's not enough variety, try oyster mushrooms in a mushroom strudel. While you can eat oyster mushrooms raw and they can be quite pretty added to salads, they can tend to have a slightly metallic flavor when raw and cooking brings out their delicate flavor better, turning their generic-mushroom texture into something uniquely velvety. Add to that the fact that about a tenth of the population will have a mild allergic reaction to raw mushrooms, and why not just cook them? When Are Oyster Mushrooms In Season? Since most commercially available oyster mushrooms are cultivated, they tend to be available at markets all year round. Wild varieties are in season come fall. How Do Oyster Mushrooms Grow? In the wild, oyster mushrooms grow in "shelves" one over the other, usually on a fallen and rotting log, which is why they are sometimes known as tree mushrooms (although they are only one of the many varieties of mushrooms that loves to grow on decaying wood). When cultivated, they tend to take on a more individual structure, although they still often show up in clusters. Each mushroom has open gills under its cap, which tend to have a flatter, less cap-like look than button mushrooms or shiitake mushrooms. 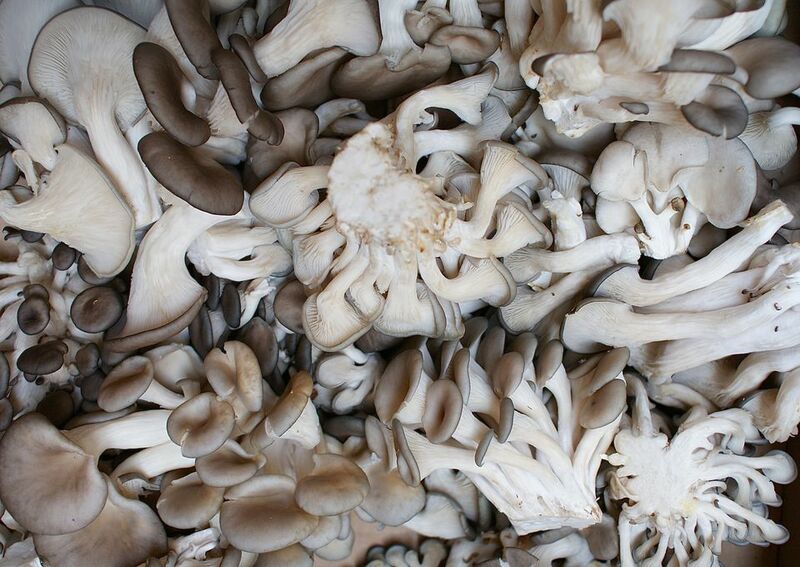 The nutritional profile of oyster mushrooms isn't much different from most mushrooms. A cup of oyster mushrooms has 68 calories and just under 5 grams of protein, almost 10 grams of carbohydrates, and less than a gram of fat. They also bring in folate, potassium, and magnesium.